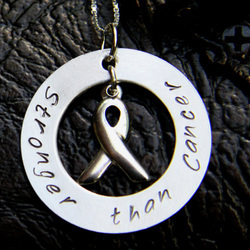 1" Sterling Silver Circle with Sterling Silver Awareness ribbon. Phrase Stronger Than Cancer hand stamped. Comes with 18" Sterling Silver Box Chain.